Congratulations to Jennifer Hallisy who has just published her first book about inspiring and nurturing young writers! It's aptly titled: The Write Start , also the name of her blog. We are a family of avid writers and readers, so I was quite happy when her publisher, Trumpeter, sent me a copy. I read through the book in one sitting... it's a fairly fast read, which is always appreciated in a parenting book. The first section focuses on writing development- from the "scribbler to the scholar". The second half contains 52 activities to encourage writing and foster a love for it. I really appreciated that many of the activities didn't call for much more than most of us already have on hand. I have a background in early childhood education, so my children have been exposed to lots of rich writing exercise over the years, but I now have a couple more tricks to add to my bag. "You play an important role in nurturing your child’s writing development. You are your child’s first writing teacher, and their most important writing role model. From teaching your child how to hold a pencil and form the letters of the alphabet, to creating writing spaces and meaningful writing rituals at home, this book gives you all of the information and inspiration you need to confidently raise a writer." 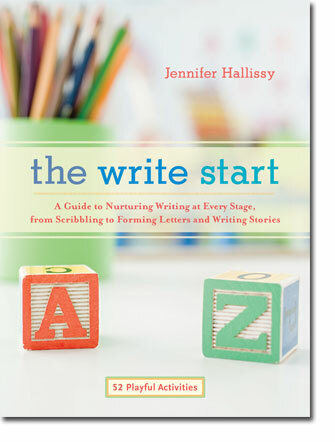 The Write Start would be a wonderful addition to any library of parents with small children and a great resource for young homeschoolers... as the emphasis is on toddlers through the early elementary years. Many thanks to Trumpeter for offering a copy to give to one of you! If you'd like a chance to win The Write Start, please leave a comment in this post before Friday at 9pm EST. I'll announce the winner on Saturday... good luck! Note: in response to the question of international readers...YES! This giveaway welcomes everyone from all over the planet. Sounds like a great book! Its amazing how little things like pretending to write a letter/postcard rather than just what they did over the weekend sparks the imagination of my Schoolboy. This is the second time I have run across this book in blog-land this week! I take that as a sign. My littlest is currently fascinated with writing letters so what a perfect read for us right now! As an avid writer myself, I would love to see the insides of this book. What is written here, has me reflecting on the many, many hours my mother spent teaching me rules of grammar and proofreading my college essays, while insisting that I understand her corrections. I hope to be the same for my two little ones. Oh my goodness this would be spectacular for my ten (almost eleven) year old. She LOVES to write and is constantly badgering me for topics. "Moooom! What should I write about today?" Of course any suggestion of mine is immediately poo pooed as nonsense. This book would be a wonderful addition to our lives. Wow! That sounds like a great book and would be such a great resource. I also have a background in education and it is so important to start writing at an early age. I would just love to have this book. Thanks for the chance to win it! This would be such an awesome book to own! I'm currently getting my elementary education licensure. There needs to be just as much emphasis on writing as there is on reading. You can't have one without the other!! It does sound like a really lovely read. I often wonder about the right age to be teaching writing and letters and things. I guess there are 'ways to teach' and 'ways to teach' - some more subtle than others. Would love to win this great looking book. Thanks! Lou. Sounds like a fab book. I don't have any babies of my own, but I do have a goddaughter would this would suit perfectly. I'd love to help her mum out by giving her this book as a gift. I am a teacher and would love to add this book to my collection. It sounds great! This sounds like a fantastic resource. I would love to use this with my girls. I tried to win this book once before! I do think it would be a great addition to my parenting knowledge. my 3 year old is so excited about being able to write his name. this would certainly give me more tools to nurture writing even more. a great resource to have indeed. I would love to win this book. My oldest son is so frustrated with writing and discouraged about school in general lately. My middle son is just starting to enjoy drawing, and my 15 month old (my first girl) is an avid scribbler already (this is new to me -- my boys both just peeled and ate crayons at her age). What a fantastic book. My son has just started grade one. I would love to help in the development of his writing, reading and storytelling, with the help of such a beautiful book. Creative writing, and kids who don't like to put pen to paper are frequent topics of conversation among homeschool moms. This book sounds great. I hope to win it so I can review it for my homeschool group's newsletter. My sister has four littles that she homeschools. I would love to win this and surprise her with it! my kindergardener is just beginning to blossom into a writer. there are now imagine spelling notes and signs al over my home. i love it! this book sounds like the perfect fit with her current activities. thank you for the opportunity to win! Very cool. I am always looking for quick writing activities at any stages for my yoga and writing workshops. Oh! I would love to get this! My kids are pretty avid writers, so I'd like to see how to help them in their journey! Also- from one mama of cat-lover to another- have you guys checked out the Jenny Lensky series of books? My daughter LOVES them! i have seen this book popping up around the internet lately. it looks extremely useful. i would love to win a copy. thank you! I just started homeschooling my oldest, so this would be great! Thanks! That looks like a very interesting books. When you stress that you think it's best for toddlers through young elementary, do you think 3rd and 1st are too old, or part of the target? My boys really enjoy writing, but I've been thinking about giving them more opportunities to develop that interest. What a lovely book. My little one can now hold a pencil, and loves our vintage typewriter. I'd love to win this! Sounds like a great book to nuture a writer. my 2nd grader is all about making books and writing stories so this would be a great addition to our library. Thanks for introducing it to us. We are just starting our homeschooling journey and this would be perfect! I might have to pick up a copy if I don't win. Thanks for sharing! Love this! My 7 year old daughter is an avid writer...she has always loved writing books and stories. Fortunately, her love of letters has been passed on to her 5 year old sister. This book sounds amazing...as I love to share the information I learn with friends and family. Thanks. My 5yo DD is just getting started with reading and writing. This would be a great resource for us! This sounds like such a helpful book! Thank you for the giveaway. Wow, sounds like a book that can help me. my son struggles with wanting to write. I hope this can help. I have literally just been looking at this book on Amazon.. Looks like a great resource! With 3 young and keen writers in the house this would be a wonderful book to have, I think! Thank you, for the giveaway.. Sounds like a great book, I'll have to look for this one if I don't win! my preschooler and i try to play school everyday. i bet this book would have some great ideas. Please count me in - sounds like a valuable resource to have at home. Maya - I would love to win this!! And I love your blog!! I'm making the lentils this weekend. What a cool book! I homeschool my 3rd grade daughter, 4 year old son, and 18 month old son. This would be a great book to add to our library. Thanks so much for the chance to get my hands on a copy! Glad too to be introduced to your website-following you on Twitter! This seems perfect for where we are now... my twin 4 year old boys are bursting with stories & learning to form letters. A resource like this would be wonderful. Thank you for the chance! This sounds like a great book! Thanks for the chance to win it! after finding her blog a few weeks ago, i have been wanting to get my hands on this book! great giveaway! my son just started writing and spelling and he is really fascinated with letters and writing. Yesterday, he made a surprise drawing for me, and with dad's help, he wrote "I love you mom"!!! !, my heart melted...i would love to see more of these love notes, when he starts learning and writing more. I guess this book would help! thank you for the intro! I would love to win a copy of this book. My little one has been keeping a "natural journal" since she could walk at the local nature center (she is 3 now.) If nothing else I will add it to the list of requests at our local library. I have been able to request several books given away on blogs if I know the publisher! YES! I'm living on the planet, in Switzerland. And me and my two little ones would like to read or see or experience the book... thanks for the chance to win! This would be a helpful additional to our bookshelf as we are in the midst of learning the writing/handwriting process at our homeschool. Thanks for the giveaway! Please, count me in too!! As a homeschooling mom with a two year old granddaugther here every day, this giveaway is perfect. Thanks so much! That book would be fantastic for my daughter with autism, who struggles with writing more than anything else in school. Sounds like a wonderful book! It is so important to encourage children to love the written word both in reading and writing. Count me in! I'm a writer expecting my first child, so of course I would love to win this book. It would mean so much to me to be able to instill a love of words in my child. Thanks to you and Trumpeter for hosting the giveaway! Sounds like a great book! I really want to help my kids love writing and to encourage writing as a form of self expression. Thanks for the giveaway - this book sounds great!! I'd love to win this for my grand daughter... she's a writer already ( carries a little book where she writes stories ALL the time) but a little extra guidance is always good.She's lucky in school this year... she has a teacher who fosters writing in a big way. My husband and I went to the school for a coffee shop-type reading event where my grand daughter and her classmates read their current stories and everyone was given hot chocolate! The kids' imaginations were great and you could tell the teacher had been stressing the time line the stories followed! Can't wait for the next read-in! Sounds neat! I'd love a copy for my little girl. Wow! I'm really interested to see this book! i have a toddler and I'm just getting interested in homeschooling ideas. Sounds like a great book. My 5 year old is not loving to read and write so anything to help keep it fun is what I'm looking for. Although my two boys are only 9 months and nearly-3, I know that our schooling days are just around the corner. I still haven't decided if we are going to homeschool, waitin instead to see what will be the better fit for our family. I do know, however, that whatever schooling decisions we make, I'll be very involved in the process and this book looks like an incredible resource. My oldest has been fascinated with letters from a young age but he has fine motor skills issue and when he started Kindergarten this year he got very discouraged with his writing. I hope this book will help us enjoy writing again. I was so excited when I saw she was writing a book but I haven't had the chance to check it out yet! I work with young children and we use a lot of her ideas daily already so I would love to add some things to the mix! Today we made a vase full of flower pencils! my 3yo is starting to write and this would be great for me to be able to direct him more! thanks for the giveaway. We'd love to have this book! I definitely think I could use this, especially with my 6yo. Crossing my fingers!! How exciting to see this book popping up several places across the blog-o-sphere. And of course I'd love for it to pop to the top of my "to be read immediately" pile, too! Thanks not only sharing this fun give away, but also sharing your enthusiasm and creativity. Thanks for yet another great give-away Maya. Please enter my name in the draw. The book sounds great. My daughter is 2 years old and is making up stories for her teddies already. It would be great to have some advice on how to encourage all this wonderful imagination. would love to win this with an active 2 year old and an autistic 10 year old this looks like a valuable resource to have! thanks for the chance to win! ooh. Wow! I'll have to put this on my library list! my son's in just that sensitive area of wanting to read and write, so this would be a great book for us! Looks fantastic. We are paddling through our first year as young homeschoolers, and I would love some writing inspiration for my 6 and almost 4 year-old. A great resource for writers-to-be. Our 6-yr old son is just starting to love writing. He is keeping a journal. This book would be a fantastic resource for us. Thank you! This is such an Important area for developing good living and learning skills! Thank you! I would love more information on ideas in literacy!! I have my fingers crossed!! What a wonderful giveaway! My oldest is just beginning to write out letters and put them together....awe-inspiring for this mama! I'd be glad to have this book as a resource! Sounds like a great book -- Thanks for the chance to win! Hello! I can see that quite many people are interested about writing...for me reading and writing is one of The Things in my life! So I'll add my comment on the list for this unique giveaway and hope the best! Thank you Maya for sharing your lovely blog and great giveaway! It's always enjoy to visit you! I would love to add this to my homeschooling library! How very cool! I am a stay at home teacher! After years of teaching in the classroom I have decided to stay home with my two children. No regrets but I always like to feel inspired and to be able to pass on great ideas to other parents and former colleagues. This books sound fantatic. This is so wonderful. Very exciting book. My little one has been enjoying drawing in the dining are where we set up a small table and chair for her with markers and crayon. We are working on her blackboard now. This would be a great resource to have for more project ideas. I'd love to check this book out. My son is not interested in reading for himself, and we've been finding ways to change that. He also dislikes his alphabet practice...I am hoping to break this dislike before it becomes rooted. (He just turned six.) Thanks! Sounds like a really great book! With three young homeschoolers in our house, this book would be put to good use here! Thank you for this opportunity. Oh how I would love this book! I've been thinking about it ever since it came out in December, I just haven't gotten around to buying it yet. I'm always looking for new ideas for my kindergarteners and for my own children when they are old enough! My 6 year old attends a Waldorf school so she isn't so much writing stories yet, but hearing them! I would love to encourage her writing at home. I've been eyeing this book since I first read about it a few weeks ago! Looks like a great book. This is right up my alley. THanks for sharing this resource and for the opportunity to win...fingers crossed! Thanks for the chance--what fun! Oh please please please let me win!!! I've been wanting this book ever since I heard about it. Thanks for a great blog and a great giveaway! I love her blog and I have a 6 year old that I'm homeschooling that I think the book would be a great resource for us! I would love to win this book! My 4-year-old adores doing her letters, and I'm curious for insights about where to go next. It seems and looks like a great book to read! I have three little ones and this book would be a wonderful resource for us! Thanks for the opportunity! Would love to get ideas for my 2&3 year old children. If I don't win it, I think I will buy it. Thanks for sharing! This sounds like a great book. I'm trying to nurture a love of writing with my 3 little girls. I always dreaded writing during my schools days and I wish to avoid that with my girls. The busy bee at our house is enjoying making up stories and writing recipes, cookbooks and checkbook entries. As an educator and tutor, I would also love to get a glimpse of this book's gems. My girl is already school age, but I'd love to get some insight into what has happened so far and will be happy to pass it on to a younger family when I'm done. Thanks! My preschooler just started writing individual alphabet letters, so I could use this book for many years to come. Thank you for the giveaway! I would love it. As a student teacher and a lover of words I am sure I could put this to use with my first graders! Some who are just learning the art of expression. Oh, I'm very interested! My kids are still young, so I'm sure we could learn a lot. It seems vitally important for us to nurture in our children a true love for word craft in contrast to the text message shorthand that pervades our youth's culture. This book sounds like a wonderful way to begin! Oh I'm a writer and already am looking to instill the love of writing in my little ones. Can't wait to see this book! Hope to win it. I'm a big fan of her blog, so I've been excited to get my hands on the book. Would love to own my very own copy! Thanks! Yes, please! My daughter just turned 5 and we are officially going to start homeschooling this fall. Perfect timing! oh I would love this for my girls! I grew up loving to read and hating to write. So far my little ones like books, and I'd love for them to enjoy writing, too. This book seems like a wonderful help! I would LOVE this book. I homeschool my 5 and 3 year old and my 1 year old joins us at the table for a lot of it. Writing has been a tough road lately. I even blogged about it and how I've been trying new and creative ways to make it fun and productive. I NEED this book! I would love to win it. In the mean time, I'm off to check out the blog. Thank you so much for that link! This is the book I need now to teach my 4-year-old son to start writing more. He just shows a little interest in writing letters and I don't know how to help him. my 2nd grader is all about making books and writing stories so this would be a great addition to our library. Thanks for introducing it to us. Sounds like an important book! I look forward to reading it. I love her blog! Thanks for the giveaway. thank you for this giveaway. i would like to have this book!!! We have such a love of books and story telling in our house. My 4 year old son has really been spinning some yarns- it's great! His little sisters (21 months) benefit from it as well. Great stuff! As a former middle school writing teacher, I recognize how important early writing is. I would love this for my grandchildren. I'm an early childhood education major at a university in Texas, & I cannot imagine how useful this book would be. Writing is truly valuable! what a great book - i love her blog - and yours! Maya, I've been reading your blog for so long -- you always have such lovely ideas, or idea sparks. I have a non-writer -- I need this book! Thank you for the information and the give away! This book sounds great! I love to write and would love to inspire my son to write as well... when he's older (he's only 16 months now). Looks like a wonderful book! I think sometimes its easy to focus on the reading and forget about the writing. We are just starting to homeschool- I'll have to keep this book in mind. Looks great! WOuld love to try it with my 4 and 8yr olds. This would be perfect for our family! My four year old is starting to write his letters more and more and well, soon enough we will be writing words, then stories and so on. I think this book would help a great deal, when mommy runs out of ideas. What a neat book! I have a 6 year old who loves to write stories and my 4 year old is starting to take after her big sister! Oooh, that looks like a fabulous book! Can't wait to check it out. Thanks for the giveaway! Hi Maia, that is a nice give away, thank you and Trumpeter! My oldest girl is 4 and just discovers the letters of the alphabeth. She just learned to write her name Mathilde. Her younger sister (2.5) already enjoys playing with letters as well and recognises her own letter N and the one of her sister and the first letter of their favorite cousin. That book would help me with keeping and letting grow their love for letters and writing. Sounds like the perfect for my budding author! Hope I win, thanks for the chance! wow great giveaway. my little one is starting to make up her own letters of the alphabet these days, so this would be perfect timing to get her going with the regular letters! This looks like a great book! I am an art teacher and new mom...would love to use this! Having fun with writing is so important for children - bring on the ideas! I love creative forming of letters and wonderful scribbles!! I would love to read this book and thank you for a wonderful blog! I love reading it! I teach writing to middle schoolers but I'm lost when it comes to little ones. This looks wonderful! Thanks for the giveaway!!! I've always been intimidated by writing (no correct answers like Math) so this will be a handy book if I homeschool our wee one like I hope. Cool! I've heard about this book once before. It would be great to have on hand as we homeschool our two children. Yes please! My 3 yo is just showing interest in learning to write letters so it would be perfect timing. My 12 year old is so interested in reading and writing! I would love to keep encouraging her with the book! Even if I don't win, I'm going to buy this book! Looks awesome and I think my sons would love it! I know three wee~ones and a Mama who would adore to win this book. looks a great book- i have it on my wishlist! Little madam is only 2 but the earlier the better right? What a great book idea! Thanks for your generous offer. What a wonderful book! I "made" my own books when I was little, and would love to collaborate with my son by making stories together. This book will certainly help him express that 5-year old imagination into written words. i read her blog and would love a copy of her book. Sounds like it would be a great book to teach the little one to read. How exciting! Would love to share this book with my sis! We were both homeschooled and are homeschooling now. Looks like a wonderful book. I wish more people would get their children or even themselves to write properly instead of Abbreviations for every other word. I can't wait to check this one out.